Nintendo 3DS owners don't have many choices when it comes to picking out a new RPG nowadays. Aside from DS games, the only title currently out in the genre is Shin Megami Tensei: Devil Survivor Overclocked, which is itself a port of a 2009 DS game. 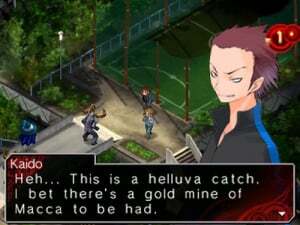 Atlus's decision to bring the title over to the 3DS may seem a bit confusing at first, especially when you consider the amount of updates included, but once you dive into your first online bidding war for an out-of-work demon you'll start to understand why Atlus wants this game to be as ubiquitous as possible. 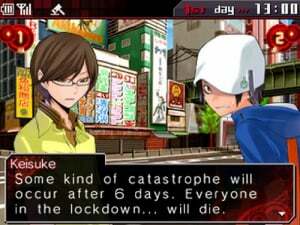 Set in a modern day Tokyo invaded by demons, the government has shut down the city and implemented a sort of martial law. 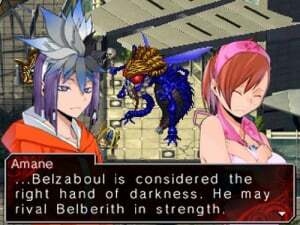 You play as a stylish young teenager who, with the help of his friends, must capture and train these demons to survive. You do so with special PDA devices called COMPs, which allow you to summon and train various demonic pets. They also let you check your email and see how many days are left until you die — this is a demon invasion, after all. To move the game forward you choose areas to “visit,” which basically just means viewing a quick dialogue exchange. 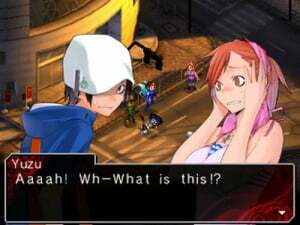 In this version, Atlus has thankfully added fully voiced dialogue, which really helps these segments come to life. After a few of these exchanges, battles will start popping up in different areas; some free battles, some story-specific. By paying attention to conversations and reading your mail, you can gauge what will be going down when, as the time of the day ticks along as you travel from location to location. This is where the game gets dark. Each morning you receive an email which predicts events that will unfold during the day. These messages are commonly cryptic and dismal, outlining bizarre deaths across the city. The nonplussed tone of the text comes across in a dry and comical manner, but the underlying theme is a bit more serious. Your COMP pops out an estimate for how long it expects you to survive. It ironically calls this process fate, and it's up to you to prove it wrong. The story commonly meditates on notions like free will and the inevitability of death, but does a good job of keeping it light and not too heavy-handed. At first you and your friends are merely fighting to survive, but eventually unravel a bigger mystery behind the catastrophe. The game combines excellent artwork and simple 2D sprites and visuals to bring its world to life. While the graphics are certainly not groundbreaking, the visual style is consistent and detailed. Things like movie ads sit on billboards and paper and rubble litter the streets. The lack of 3D visuals really seem like a missed opportunity though, and the leisurely, time-consuming pace of battle could have benefited greatly from such an addition. Battles send you into a grid-based arena populated with enemies, and in order to survive, you'll have to strategically manoeuvre characters around the map, getting injured characters to safety and attempting to isolate foes to attack them as a group. General combat comes in the form of turn-based attacks, but to get the upper hand you need to gain “extra turns," done by nailing critical attacks. These can come by chance, by lining up elemental weaknesses or by casting spells that guarantee at least one critical hit that round. As a rule of thumb the enemy is more likely to get these than you, so you need to really work hard at this in order to survive. While luck is always some part of the equation, the game does a good job at rewarding well-thought strategies, even doling out cash and experience boosters to especially impressive bouts. Strategies outside of fights are important as well, like casting support spells on the battlefield, positioning characters and scoring Skill Cracks. 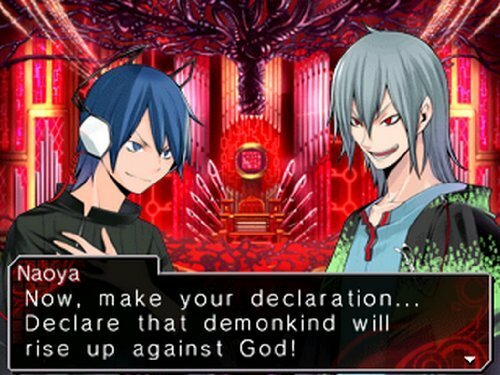 These allow you to select demons for specific characters to defeat. If they do, you'll learn a specific skill of the defeated demon, Mega Man style. The management of your demons also plays a big role in success. The two demon allies each character can keep are upgradable and can be set with specific skills, but new monsters also become available to purchase via your COMP. Using money won from battle, you “bid” on these demons against other imaginary online bidders. The monsters even have a byline, and are prone to shouting in capital letters, making way for such comical gems as “I HATE VIOLENCE” from a wolf man. Winning bids raises your rank and enables you to acquire more powerful demons, but overbidding and defaulting on payment lowers your rank. You eventually learn to combine demons, which becomes a necessary tactic to defeat the ever more challenging monsters that want to kill you. The most notable addition to the 3DS version of the game is undoubtedly the 8th Day scenario. This segment adds on more content to the tail end of the game, extending the story and offering up more skills to crack and demons to fight, not to mention a final boss battle. If you already own or played the DS version, this may not be the reboot you were hoping for. For those coming to the title with a fresh face however, prepare to be impressed. Even though the game doesn't offer up much of an overhaul, it still remains a stellar, stylish game that handily melds strategy and turn-based RPG battle. It's definitely one of the heftier 3DS games out there too, with multiple endings and tons of content to explore. On the DS, Shin Megami Tensei: Devil Survivor was just another drop in the role-playing ocean. Here's to hoping it gets the limelight it deserves on the 3DS. i generally like what atlus brings on the rpg market. ill skip it for now, but defenitely pick it up somewhere in 2012. I should probably start getting into these games. I think the only game I have publised by Atlus is Contact.. Waiting for the sequel! It's such a shame.. The only cool game on the 3DS and it's not coming to europe (insert a generic rant about nintendo region locking 3DS here) at least I can still play the original DS version. 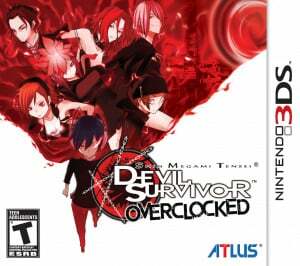 Nevertheless I ordered myself a copy of this game even though I can't play it, just to give my support to Atlus. I was playing the original a few weeks ago after dismissing it first time round due to how hard it is at first, but like with most RPG's a bit of early grinding always helps. Really great game, shame most Atlus games never hit the EU and I don't expect a change here. But with Tales of the Abyss coming next month and Cave Story all my time will be bled into those anyway. Skyward Sword, Tales, Cave Story, 3D Land, Shinobi, Kirby Mass Attack and Blazblue, November is a cruel month. Wow an atlus review! I've been enjoying this for a little over a month now! Its been a slow grind but I'm on day seven so almost there! Great gem of a game! I would give it a 9 all the way and a must play for any RPG fan! Any other additions other then the 8th day? I'm interested but why should I get this over the DS version which I bet is cheaper? @#9 In addition to the eight day it also includes voice acting better graphics as well! Also offers more demons then the DS version! This review came a little (read a lot) late...it's already up to $80 on Amazon. For those reading this, it's a pretty common occurance for Atlus games. That's why I always preorder. i saw someone on friend list playing it.thought it was maybe a ds game.shame they arent giving it to us. I love this game. i'm still playing it and atleast clocked in 30 hours. It's very addictive. Since I never played the original, this is definitely a 9 on my part. Excellent game. Love this game! 8 is way too low. I was a little...worried about the voice acting at first. I thought it would be kind of annoying and whatnot. Although I was pleasantly surprised when I first heard the voice acting. It sounded natural, not at all forced. I got this game when it came out because I didn't really like what the 3DS had to offer. I don't regret it at all. If you've played the original, I wouldn't pay any more than 20-30$ But if you haven't, this is the game that will hold your attention until SM3DL comes out. It will still hold your attention after SM3DL comes out. Amazing game. I love the addition of voice acting as it melts away the text heavy aspect. Highly recommended for fans of the SRPG genre. Is Contact any good? I always wanted to play it but i never got around to it. Woah, it actually turned out decent. Won't be getting it though, since this game doesn't sound like my cup of tea. @Garfi3ld Kirby: mass attack is out this month and Kirby's adventure wii is out next month. I wish this would get a European release but if it doesn't then I could go back to my copy of the original. The BS region-lock is bound to affect a game i care about sooner or later... damn Nintendo. Being a DS port, it's not really a huge loss with this game though. If you haven't played it, BUY IT. I'm looking forward to the sequel (at least i can import that). I need to get this now. It a little rare for me to read reviews,so I'm hoping this game will hold my attention until SML3D or Mario Kart 7. I also have not bought anything since RE:Mercenaries and Middle school is so stressful. Are Japanese cosplayers voices generally really high? Midori's voice seems really high pitched (and annoying). @Aqueous: You yourself even admit that Samurai Warriors 3DS is not considered to be an RPG, so I'm sure Patrick can be forgiven for not thinking of it as being one himself. You also admit that he reviewed the game, so I'm not quite sure why you're questioning whether he played it or not. Good to see that the 3DS is now starting to get some RPG's. @theblackdragon - I removed the comment for you and have put out some help for you under the games review, also I left my reasoning there also. On topic I thought this to be a good review and now I'm looking into this game, for it looks good and I never even heard let alone knew about the ds realise, might need to find this update. Nice review. I played it and the english voices were quite a turn off and I felt so much better playing after I muted it otherwise the game is just as great as I remember it to be. Shame on Atlus to not even offer dual audio since the Japanese voices sound SO MUCH BETTER!! cause it makes perfect sense for Japanese teenagers that live in Japan to speak with an american accent /sarcasm. ^ Licensing Japanese Voice acting is extremely expensive apparently. @Mickeymac - But its moves like this that force people to extremes like undubbing their game so it sounds better and bearable which I want to do, the voices sound fine in Japanese but it just sounds too corny in English wait i'm sorry I mean American cause if I say English then they're meant to sound British which would probably make the game sound better to me. Yes midori's voice is annoying but at least its the only annoying voice in the game really. I found Yuko's voice annoying too but overall i found a lot of the voice acting to be pretty decent. I've heard a hell of a lot worse. Great game by the way. After my long grind with Okami is done i plan on playing through some more. which ever is cheaper I guess. Heh the very first street pass I got the person had this game as their most recently played game. After reading this review and the comments I am thinking I might have to pick this one up. I wish this game was available in Europe. 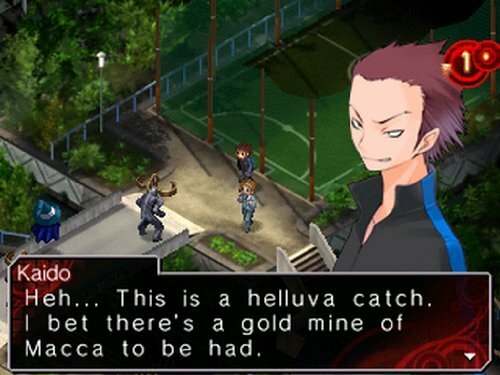 The only Atlus game I have had the chance to play was SMT: Lucifer's Call, and that was great. Oh man, please make this PAL version release. this game is really fun. early on I just wanted to hear more of the story so I disliked when I had to do a battle, but every part of the game grew on me pretty quickly. I can't get myself to mail the game back to gamefly until I beat it. Just make sure to save your game a lot because dying and then having to go through a bunch of conversations again is pretty annoying. This game is absolutely awesome! I played the game 4 times on the DS and have played it 4 times again on the 3DS (both times Atsuro's route left)! I still have to beat the last route! I feel that the game is worth it even if you have played the original as addition of voice acting, compendium, new demons and 8th day have added a lot to this game! 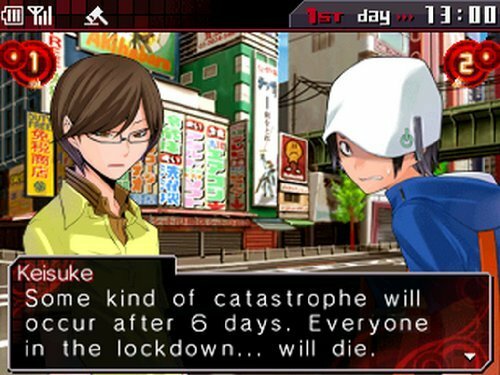 I just think that it would have been possible to include Atsuro and Gin's 8th day as well.